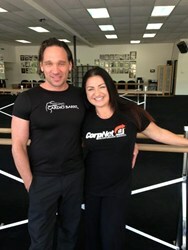 Cardio Barre founder, Richard Giorla, prefers CorpNet for business formation and legal filing needs for Cardio Barre and its franchisees. CorpNet has been amazing throughout the entire process. They are extremely responsive and extremely organized. They take care of all the dirty paperwork that we don’t enjoy doing. CorpNet.com, a leading online business document filing company that helps entrepreneurs start a business and keep a business in compliance, announced today that Cardio Barre®, one of today’s hottest fitness workouts, has selected CorpNet.com for its document filing needs, including LLC formation. Richard Giorla created Cardio Barre in 2001 in Studio City, California, based on his 30 years of dance experience and classical training. Cardio Barre is a high energy, no impact exercise class that combines barre work and light weights with continual fat burning motion. Many celebrities have trained with Giorla’s Cardio Barre program, including Jenna Elfman, Neve Campbell, Lucy Lawless, Laura Leighton and Dakota Fanning. When he first founded Cardio Barre, Richard Giorla turned to CorpNet.com for LLC formation. Since then, he also recommends CorpNet to all his franchisees. Cardio Barre currently has 14 franchises in Los Angeles, with a couple more franchises out of state. Giorla plans to take his program global with hundreds of franchises in the next few years. “CorpNet has been amazing throughout the entire process. They are extremely responsive and extremely organized. They take care of all the dirty paperwork that we don’t enjoy doing,” said Giorla. First launched in 2009, CorpNet.com has helped more than 10,000 small businesses across the country form an LLC or Corporation, file a DBA, keep their business compliant, and more. While a smaller company competing in a crowded marketplace, CorpNet.com has made a name for itself for its personal touch, including friendly in-house phone support. The company has also been investing heavily in developing a no-cost, value-add tools for its clients and the small business community, including: B.I.Z. (a no-cost corporate compliance tool), free meeting minute templates, and numerous free guides on starting and growing a business.